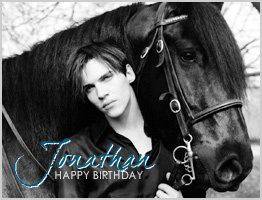 Jonathan Rhys Meyers Fansite > Happy 34th Birthday Jonathan! special people. Rich birthday blessings on you! Joyeux anniversaire en retard Johnathan! I would like to wish you a happy belated birthday. I left comments on this website a few weeks ago, hopefully you got all your “well wishes.” They were supposed to get to you by 7/27. This was my mother’s prayer. She was an alcoholic in her thirties. I was a young teenager and my Mom and I didn’t think she had a problem. But my close friends knew she did and helped me, to help her. It didn’t take long for her to conquer her demons and get sober. It might have been quick for her to get sober, because she had young children to raise with my wonderful Dad. Happy belated Birthday Jonathan! Hope you had a special day and may you find happiness. Seems like I’m wishing you too late, but it doesn’t mean that I don’t mean it as much as the other’s! Happy birthday in arrears,Jonathan. I hope you had a wonderful day! Wish you always have the best of life because you deserve it. I love all your work. I wish you lots and lots of health and happiness; hope to perhaps someday meet you. That will be a good day for me. Hope it’s a great day and the year ahead finds you happy & healthy! I just saw “August Rush”…what a wonderful DVD…loved it. I also have ELVIS The Miniseries…as a long time fan of Elvis…I am now a forever fan of you. Hi Jonathan. A happy belated Birthday hun. Hope you received my letter (words of encouragement). YOUR A FIGHTER JONATHAN & AS I SAID “STEP BY STEP”. Congratulations, Jonathan! May your year be a way of life triumphant, and you can go without a hitch. Success, Health, and much love to you. I’m from Brazil, but I’m a big fan of yours. Thanks, God Bless you. I’m a big fan of yours, forever fan. I know it’s late …. You are my idol, my role model and my favorite actor ever. I am a forever fan of you. HAPPY BELATED BIRTHDAY JHONNY! I think you are a very gifited actor, and i hope that you have a great and successful year, I beleive the future has nothing but the best in store for you. Jonny, hang in there, friend. Just watched you on TUDOR and you WERE Henry VIII. Such a convincing performance. We love you and your craft too much to not feel your pain. You have so much to bring to the rest of us, please take care of yourself. I know, some day you will be able to look back and laugh in wonder at your troubles now. Love you, love your acting and movie..
Keep waiting for your next movie..